Pana Papas Merchant was born April 2, 1943 in Greece. Educated in Greece and Canada, she obtained a B.A. from the University of Saskatchewan and a Teaching Diploma from the University of Regina. She worked as an elementary and junior high school teacher, and later a businesswoman, and has played an active role in cultural, political, and advocacy groups in Saskatchewan. 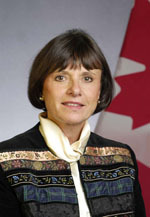 She is the first Greek born woman to serve in Canada’s Upper Chamber.